Another season of Test Cricket started for Pakistan yesterday with the start of the two test series against Australia. The last time the two sides played test cricket, Australia, in their own backyard, blanked Pakistan 3-0. However, the last time the two sides were in the UAE, Pakistan defeated them 2-0 with ease. Tim Paine, captain of Australia and Sarfraz Ahmed, captain of Pakistan addressed the media ahead of the 1st Test at Dubai Sports City. 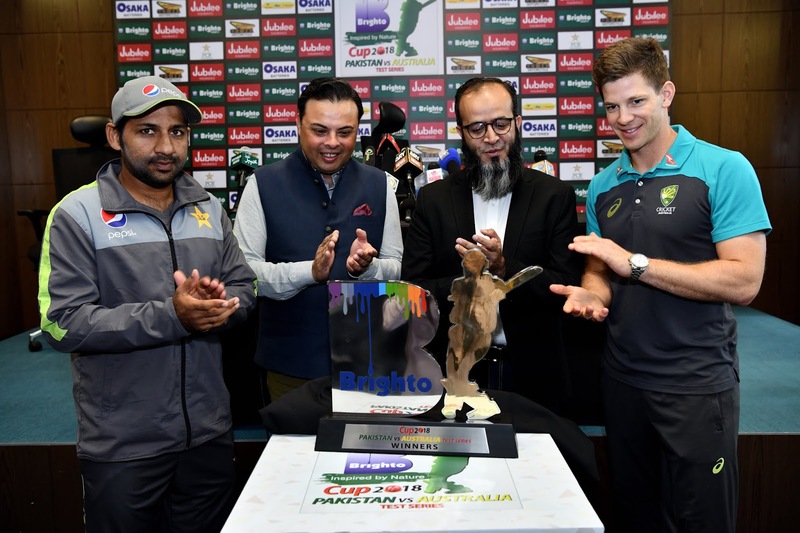 The trophy for the Jubilee Insurance presents Brighto Paints Cup 2018 was unveiled by the two captains in the presence of Syed Usman Qaiser (Chief Marketing manager Jubilee Insurance) & Kamran Ahmed (representative of Brighto Paints. The last time the two teams played a Test at Dubai Sports City was in 2014. Pakistan won that game by 221 runs and their current captain, Sarfraz Ahmed scored a century in the first innings. This Test marks the start of Pakistan’s home season. They’ll play two Tests before playing three T20s against Australia. After that Pakistan will welcome New Zealand for three Tests, 3 T20Is & 5 ODIs. Sarfraz Ahmed was very candid during his pre-match press conference. When questioned about the team for the first test, he gave out 12 names, which confirmed a test debut for Bilal Asif with a decision to be made in the choice of Mohammad Abbas' new ball partner. Pakistan’s 12 for 1st Test: "Imam-ul-Haq, Mohammad Hafeez, Azhar Ali, Haris Sohail, Asad Shafiq, Babar Azam, Sarfraz Ahmed ©, Bilal Asif, Yasir Shah, Mohammad Abbas – We’ll decide on the fast bowlers tomorrow before the toss - Wahab Riaz & Mir Hamza"
When questioned about Nathan Lyon, who managed 8 wickets in the first innings of Australia's only practice match, Sarfraz said "We played against Nathan Lyon in 2014. He is a different bowler now. He has a lot of wickets in Asia. We have made a plan against him during our batting meetings. Hopefully we’ll execute our plans against him during the match"
On Yasir Shah and the impact he could have, Sarfraz was very confident in stating "Yasir Shah suffered an injury during the England Tour. He is fit now and regularly playing first class cricket. He has worked really hard. He is our main bowler and hopefully he’ll guide us to victory"
When asked about the comeback of Mohammad Hafeez, Sarfraz had plenty of encouraging words "As far as Hafeez is concerned, he has been batting really well on the domestic circuit. We need to benefit from his batting form by playing him as an opener. He’ll also fill in as the fifth bowler. His inclusion is really crucial for the balance of the side". With the way Sarfraz addressed the media, he seemed very confident and there is no reason why Pakistan can't repeat the result of 2014.